Share & "Like" This Topic on Facebook! Here is a train stop circuit I made with a modular single shot 12VDC timer and DPDT relay. With the trigger jumped it becomes an interval timer. Relay and timer can be powered off track power or from a separate source. The bridge rectifier supplies DC for the timer and relay. Installed is a 7812 regulator to protect it from over voltage from track power. It will work down to around 6 volts track power. The TVS protects from voltage spikes. The 1 meg pot makes station stops adjustable up to 180 seconds. The large capacitor 470 uf 35 volt eliminates chatter. The small capacitor .05 stabilizes the regulator. The barrier strip offers ease of hookup and organization. 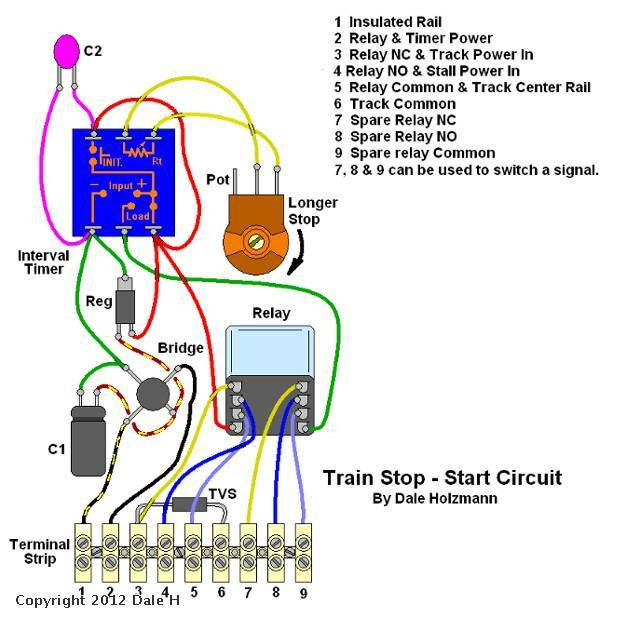 When train rides over an insulated outside rail (the wheels complete the circuit) the relay coil activates until the time set by the pot on the interval timer then de energizes. Track power going through the NC contacts is removed or optionally fed a stall voltage around 5 volts through the NO contacts to keep lights on the train and make the stop softer. When the train leaves the block the timer module is reset for the next event. See my post on pushbutton circuits up to 180 seconds for more detail on the timer. The spare set of relay contacts can be used for a block signal if desired. See my relay post for activating relays using an outside insulated rail if you are not familiar with it. A special thanks to Bob of OGR for making a computer pic of the circuit. Hello Dale: I am new to the forum and read the above item and thought you may be able to help. 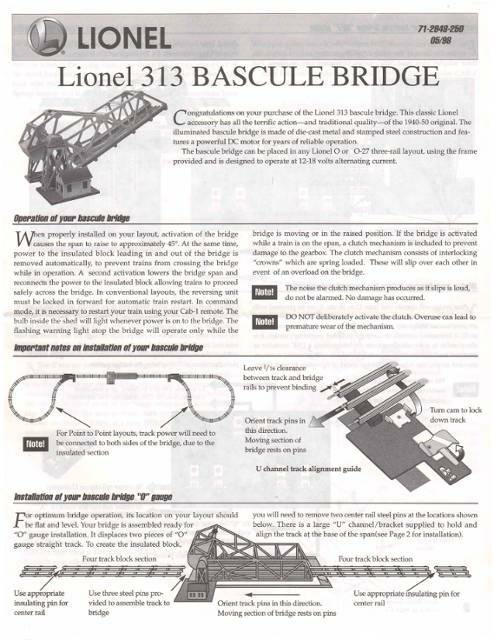 I purchased a 313 Bascule Bridge and love it. My question is the alternate wiring plan. I am using fastrack isolated track section and was able to get the bridge to open as the train approaches. The problem is how to get the bridge to close. Is there a way to time the bridge to lower automatically? Yes,but I need to know more about the layout. There are a lot of circuits which could be used. It would be easier to open and close the bridge randomly and have the train stop if it approaches. If it is already on the bridge,it could be locked out from opening until the train clears. I would have to refresh my memory about the bridge,if it is PW or the repo version. Second you may have to cut into the harness and figure out the controller wires. Then I would have to draw a circuit. I did one of these a long time ago,but dont remember the specifics.It is a little involved. 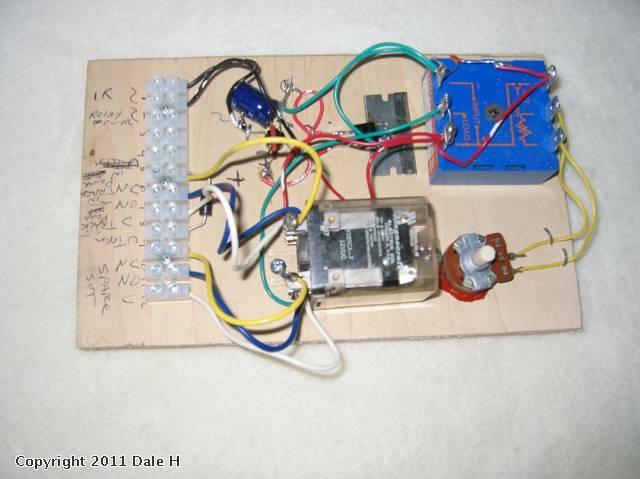 See the Mars timer circuits,the last one in the post under Dale H. You could use 2 Mars timers and 2 relays I think. The bridge would go up and down cycling as set by the timers. 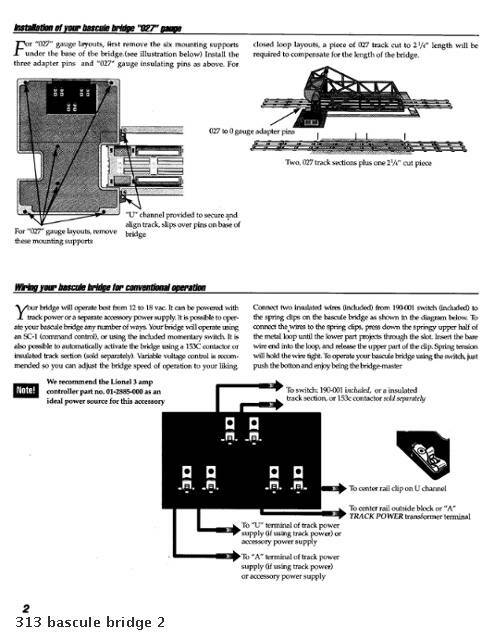 A third relay could be used to prevent the bridge from rising if a train is already on it. After the train leaves it would resume its cycle. You would need to make an outside insulated rail on the bridge approach and through the bridge for this to work. If the train arrives after the bridge is up,the train would stop and wait for the bridge to close. This circuit is already in the bridge as it removes power from the center rail section when up. I will study it a bit more. Doing this can be a bit tricky,let me know if you need help. And also keep us updated with your progress, sounds cool! You are going to need an insulated outside rail from the outside of the bridge and through it to detect the train presence. Off that you need to activate a SPDT relay. See my post on relays for block detection. This contact set will lock out and prevent the timing cycle from beginning if the train is already on or near the bridge. 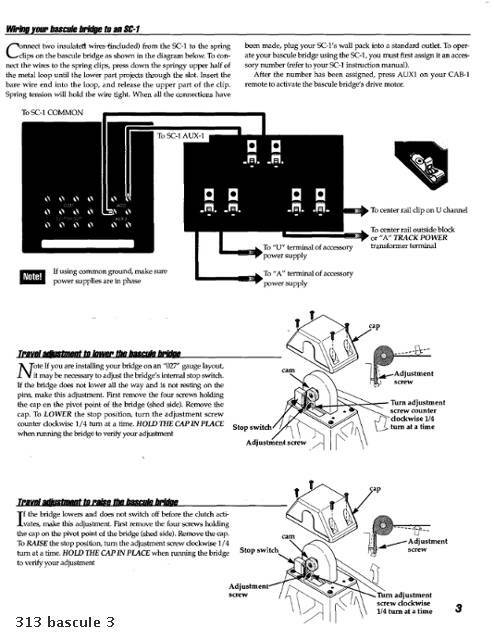 Then you will need an additional contact on the timing circuit which locks out this relay coil if the train is not on the block, and the bridge raises then the train arrives. The other contact set NO and NC will raise and lower the bridge. With this arrangement,the relays will mutually lock out each other so whichever happens first prevails. A similar circuit is shown in "automating a passing siding" and crossover protection where where contact sets of 2 relays lock each other out where only one at a time can activate. Whichever train arrives first determines the relay that is on but both can not come on at once. © Copyright 2007-2019 J&C Studios, Inc. All rights reserved. Check the boxes next to the Categories this topic should belong to. Uncheck to remove this topic from a Category. Don't see a category here that you think should be? Don't see your photo here?